Making new design sketches or even full-sized clay models is relatively cheap compared to the millions of dollars wasted when a carmaker decides to ditch a fundamental part of their already half-developed car, only start all over again. Yet the latter just keeps happening. In most cases, bad ideas can still make it into production due to the bean counters pulling the alarm because of raising costs and the engineering team running out of time. That's when the marketing department steps in to dress up a bug as a feature, but since supercars represent the peak of what a carmaker can do, the usual shortcuts of a grocery getter are rarely tolerated. Everybody knows that the McLaren F1 got a wonderful V12 from BMW's M division. Some even know that it weighs 586 pounds. But Gordon Murray's original target weight was 551 pounds for the powerplant, and since McLaren's Formula 1 supplier was still Honda at the time (he considered the NSX to be the benchmark for his new car), the shopping trip for a 4.5 liter V10 or V12 started in Japan. When the Honda plan fell through, Isuzu offered their 3.5 liter V12 to McLaren, but their lack of racing pedigree turned Murray's attention towards BMW. Some say even Judd was considered as a supplier before them, but what's for sure is that the S70/2 reigned victorious despite being heavier than planned, as it also offered 627 horsepower instead of their goal of 550hp. What you see here is the Lamborghini P132 prototype from 1985 sporting Marcello Gandini's original design for the Diablo's body. What happened was that after sugar billionaire Jean-Claude Mimran and his brother bankrupted Lamborghini with the Cheetah, Chrysler took over and changed everything. They commissioned their home team in Detroit to redesign the body by smoothing out Gandini's sharp edges and corners before it hit the stages. The Italian master was so pissed about the result that he made the Cizeta-Moroder V16T happen as a big fu to his old company. When a few Jaguar employees known as the "The Saturday Club" started working on the XJ220 project in their spare time, they had the fastest supercar in mind with an all-wheel drive system for maximum traction. Their finished concept also had electrically operated scissor doors and a transparent engine cover to show off its V12. But Jaguar soon ran out of resources and the XJ220 program was outsourced to their racing team. As a result, Tom Walkinshaw Racing built 50 "production" Jaguar Sport XJR-15s between 1990 and 1992. Based on the everything-winning Jaguar XJR-9, they were the world's first fully carbon-fiber road-cars selling for $960,165 at the time. As for the Jaguar XJ220, the world's fastest thing happened, but the all-wheel drive and the V12 did not. Instead, the car had a twin-turbo V6 from a Group B Metro rally car. The Sheikhs were not impressed. Lexus started 'Project P280' more than ten years before the first LFA was delivered to its customers. That's how long it takes to make a supercar if you decide to switch from an aluminum frame to a carbon fiber tub just before the car was about to enter production. Oh, not to mention inventing a giant carbon fiber loom to make 3D pieces happen. I'm not saying it wasn't worth the wait, because the LFA turned out to be one of the coolest cars ever, but I really hope the Japanese at least have a special word for burning large heaps of cash. 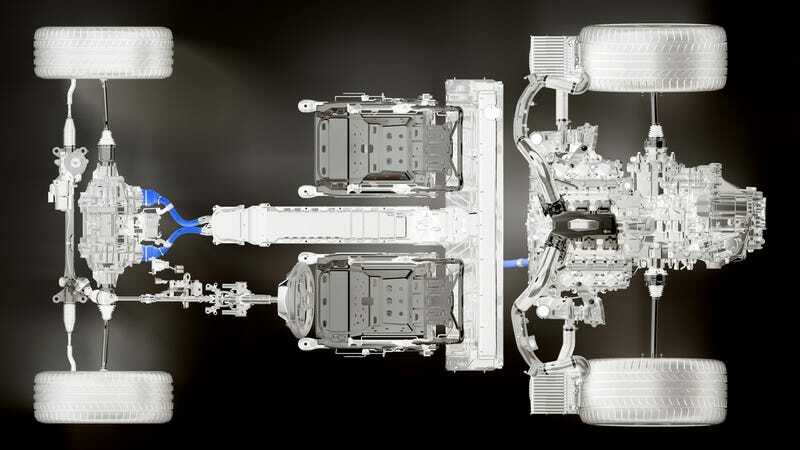 While we knew how the 2015 Z06 looked like as early as in 2011, Chevrolet had to rethink the whole drivetrain before they could call their ridiculously fast C7 production ready. We looked at a number of different NA designs, even with the best tech applied, we could not meet our horsepower, durability, and emissions requirements for the lifecycle of this car. I was an NA fan, would loved to have done it. We looked at a turbo as well, but for total vehicle performance, it wasn't as good as the supercharged version. Did it take them forever? Yes. But going from a transverse to a longitudinal engine layout is no simple task, and it might just work out well since in theory, now even a V8 could fit in Honda's brand new supercar. Well, we can't wait to jump in it, with or without.